The sumo deadlift is an effective deadlifting movement to increase upper back, hamstrings, glutes, and trap development. The versatility of this allows the movement to be seen in powerlifting programs and meets, general fitness and workout plans, functional fitness, and even Olympic weightlifting (yes, Olympic weightlifting). 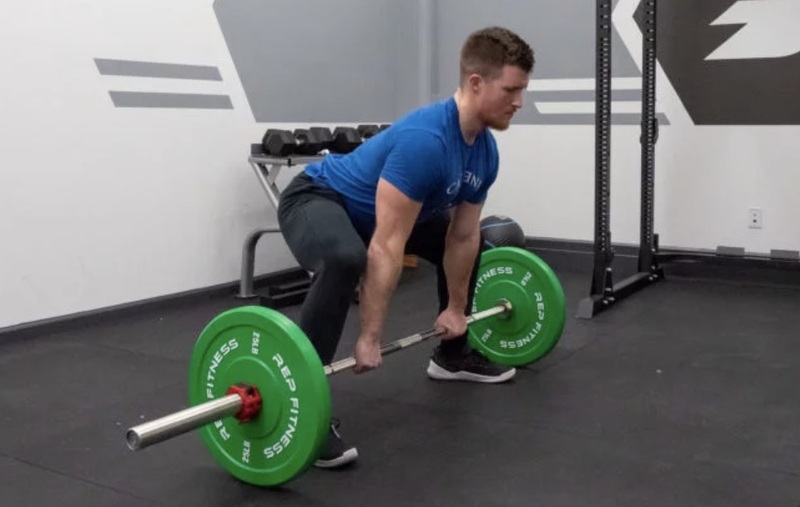 The sumo deadlift can be done with a variety of tools, however the most variation method is the barbell sumo deadlift, which is discussed below. Start by assuming a wide stance with the toes pointed out. The stance itself should be wide enough to allow the arms to be extended downwards, inside the knees (elbows inside the knees). The stance width will vary, however generally speaking, the width should allow for the athlete to have the shins perpendicular to the floor with the back flat and shoulders directly above the bar. Coach’s Tip: Think about pulling the hips down to the bar, keeping to core tight and braced. The knees themselves need to be pushed out wide to allow the torso to stay slightly more vertical than a conventional deadlift. Once you have set your positions, start to build pressure throughout the body to minimize any slack in the arms, legs, and back. This can be done by slightly pulling up on the bar and pressing the legs through the floor (without moving the bar yet). Once you have found your best tension position, set the breathe once more and proceed to step 3. Coach’s Tip: Visualize pressure rising in the body before every pull, with all the muscles being engaged and ready to fire at once. Now that you are in the correct positions and have no slack in the body, its time to attack the barbell by simultaneously driving through the feet and pulling up on the bar. The key here is to not allow the chest to fall or the hips to rise in the pull, but rather to have the barbell stay close to the body as you stand up. Coach’s Tip: Keep the chest up, the bar close, and pull. Below are the primary muscles groups worked by the sumo deadlift. Similar to other deadlift variations, the sumo deadlift works the gluteal muscles, hamstrings, and back (posterior chain). There are however, some slight differences between the muscles worked from the sumo deadlift vs conventional deadlift vs trap bar deadlift; which are discussed below. The glutes are targeted to a high degree by the sumo deadlift, primarily due to the foot/hip placement in the setup. The hip is placed in external rotation, which in turn involves the glutes to a higher degree, making this a great movement to target the glutes. The hamstrings, while not as targeted as in the Romanian deadlift and conventional deadlift, are still primary movers for the sumo deadlift. If a lifter is looking to target the hamstrings more exclusively, they may want to perform Romanian deadlifts instead. Due to the foot placement in the sumo deadlift, the athlete must achieve greater angles of knee flexion (bend) to set themselves up and perform the sumo deadlift. For this reason, the quadriceps (which are responsible for knee extension) are targeted to a greater degree than in the Romanian deadlift and conventional deadlift, yet similarly to the trap bar deadlift. The lower back muscles, also known as the erectors, are stressed isometrically throughout the sumo deadlift to resist spinal flexion and rotation throughout the pull. In doing so, the spinal erectors can be developed and are often one of the key limiting factors for a heavy deadlift (lower back strength). Unlike the conventional and Romanian deadlift, the sumo deadlift does place lower levels of stain on the record due to the athlete being able to keep their torso angle more vertical in the set up and pull. The upper back and trapezius muscles are used to maintain proper torso positioning and aid in the upwards pulling of the barbell. The sumo deadlift, which is a more vertical pulling movement (compared to the conventional deadlift) is a great movement to build thick, strong traps and upper back muscles. Below are three (3) benefits of the sumo deadlift that coaches and athletes can expect when they integrate the sumo deadlift within a training program. The sumo deadlift is another deadlift variation that can be used to increase overall pulling strength and muscle mass (similar to the conventional and trap bar deadlifts). The sumo deadlift can be done in a variety of methods including bands, tempos, and more (see below sections) with nearly all individuals. The ability to load the sumo deadlift with very heavy weights can also increase top end strength and muscle development for strength sports. Unlike the conventional deadlift, the sumo deadlift has a lifter assume a more vertical torso positioning (due to the foot placement). By increasing the vertical angle of the back (torso is more upright), the lower back is not stressed as much as in a Romanian or conventional deadlift. This can be beneficial for lifters who want to limit lower back stress, monitor training volume to the erectors, or simply address different aspects of the pull. Due to the foot placement and hip/knee angles in the set up, the sumo deadlift targets the glutes (due to hip external rotation) and vastus medialis (inner quads) to a greater extent than a conventional deadlift. This can be helpful to lifters who either (1) want to develop these muscles for aesthetic or muscle development reasons, or (2) for lifters looking to target these muscle groups due to weaknesses in the pull. Who Should Do Sumo Deadlifts? The below section breaks down the benefits of the sumo deadlift based on an lifter’s/athlete’s sport goals and abilities. The deadlift (all forms) is a critical exercise for developing serious strength and muscle mass for strength and power athletes. Below are the specific classes of athletes that can benefit from performing sumo deadlifts, and why. Powerlifters: The sumo deadlift is one of two competitive ways to deadlift a load in a formal powerlifting meet, making it highly specific to the sport. Therefore, powerlifters should be well versed in the sumo deadlift to develop the skill and strength necessary to succeed in the sport. In the event a lifter deadlifts with conventional technique, it is still recommended that he/she learns and trains sumo deadlifts at some point in the base phases. Strongman Athletes: Similar to powerlifters, the sumo deadlift is a deadlift variation that can increase sports performance and enhance overall pulling strength and muscle mass. Using sumo deadlifts in strength training can help to build a well-rounded strength athletes and address muscle and movement weaknesses. Olympic Weightlifters: Sumo deadlifts are not traditionally done in Olympic weightlifting, however some weightlifting systems do train sumo clean pulls, a sumo deadlift variation that is setup to mimic the starting point in the clean. This is not essential for Olympic weightlifters, however it can build strength and postural control for intermediate and advanced lifters. The sumo deadlift, while not often seen in CrossFit WODs or training programs can be used to develop leg and hip strength in varied movement patterns other than just squats and conventional deadlifts. Increasing an athletes pulling strength and muscular development throughout a fuller range of motion and movement patterning can potentially help them be better prepared for functional based movements in future competition or training. The sumo deadlift can be a variation used to increase posterior chain and glute development and limit the overall strain on an athlete’s lower back muscles. Often, the trap bar or sumo deadlift will be used in pulling programming for formal sports athletes due to potential decreases in lower back injury (since the lifter is in a more upright pulling position). If this is the case, most coaches will supplement with Romanian deadlifts to better target the hamstrings and hips in addition to heavier sumo deadlift training. Depending on the anthropometrics, injuries history, and mobility restrictions, the sumo deadlift may one of the best options for including deadlifting into a program while remaining injury free. In addition, coaches and lifters can use the sumo deadlift as a teaching regression or as an alternative pulling movement in the event an individual would like to target the glutes and/or limit lower back stress. Below are four sets, reps, and weight (intensity) recommendations for coaches and athletes to properly program the sumo deadlift specific to the training goal. Note, that the below guidelines are simply here to offer coach and athletes loose recommendations for programming. The sumo deadlift can be used as a regression for the conventional deadlifts and/or to assist beginner lifters in learning proper hip flexion and extension mechanics in the deadlift. Coaches can also include pauses and tempos to further enhance movement awareness in the pull. The sumo deadlift can be used to develop maximal strength for powerlifting and strongman athletes. In addition, the sumo deadlift can be a deadlift alternative for lifters looking to diversify the general pulling strength. The sumo deadlift can be done for higher volume with moderate to heavy loads to increase muscle hypertrophy and general strength. The below guidelines can be used by coaches to program sumo deadlifts and most training plans. Performing tap and go repetitions will often help to increase muscle growth via increased time under tension and eccentric loading (lowering of barbell, versus just dropping). For those looking to increase glute and posterior chain muscle endurance, the sumo deadlift can be trained in higher repetition range is to increase muscular endurance and fatigue resistance. 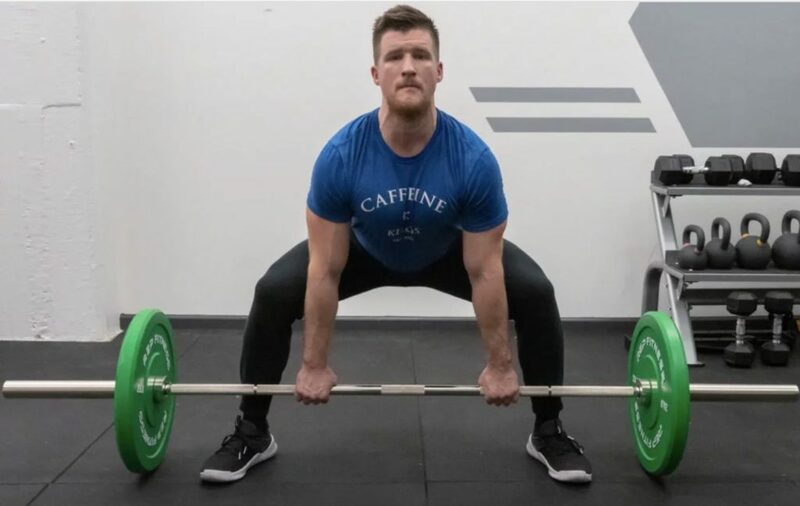 Below are four sumo variations that coaches and athletes can do to increase sports specificity, boost strength and power, and increase movement integrity in the sumo deadlift. Deficit sumo deadlifts is a variation that challenges the deepest ranges of motion in the movement. In doing so you can increase strength off the floor and target the glutes and hamstrings to a greater degree. Lastly, lifters who fail to assume a strong and stable set up off the floor will benefit from this exercise. Accommodating resistance via bands and/or chains are a great tool to increase rate of force production, motor recruitment, and maximal strength. Simply add bands/chains to the sumo deadlift and pull with focused intensity and speed. Tempo training can be done with the sumo deadlift simply by adding time constraints or cadences for the various phases of the pull (concentric, eccentric, etc ). In doing so you can increase time under tension (muscle hypertrophy), a lifters motor control and coordination of the movement, and develop greater recruitment of muscle fibers. 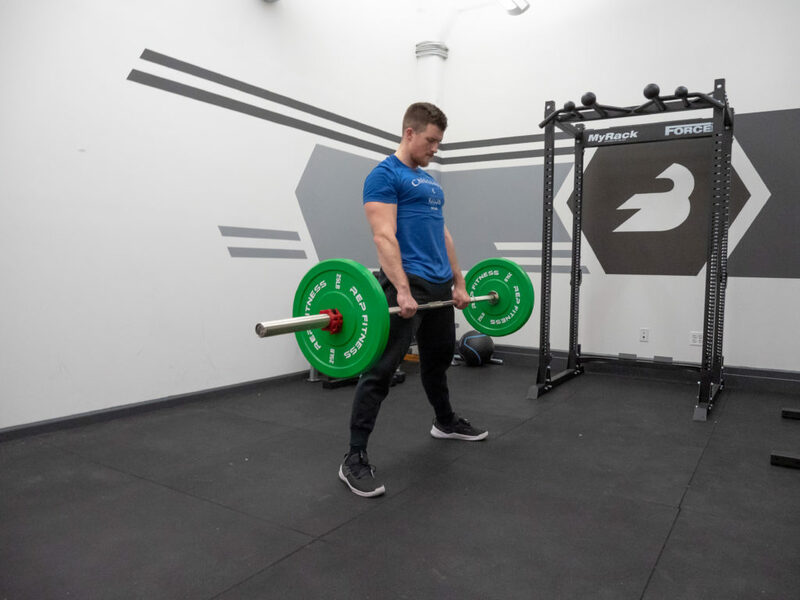 Below are three sumo deadlift alternatives that often can be used interchangeably within training to add quality muscle loading and stimulus to an athlete while still allowing for variety in one’s programming. The trap bar deadlift is a very similar deadlifting movement due to the increase knee bend and vertical torso positioning. In the event a lifter cannot or does not want to sumo, the trap bar deadlift can be used to increase upper body strength, hip engagement, and even develop the quadriceps. The kettlebell sumo deadlift is a deadlift regression that can be used to increase movement integrity and/or basic movement patterning and skill necessary for the sumo deadlift. At heavier loads, this exercise can be done to increase muscular endurance and basic strength. 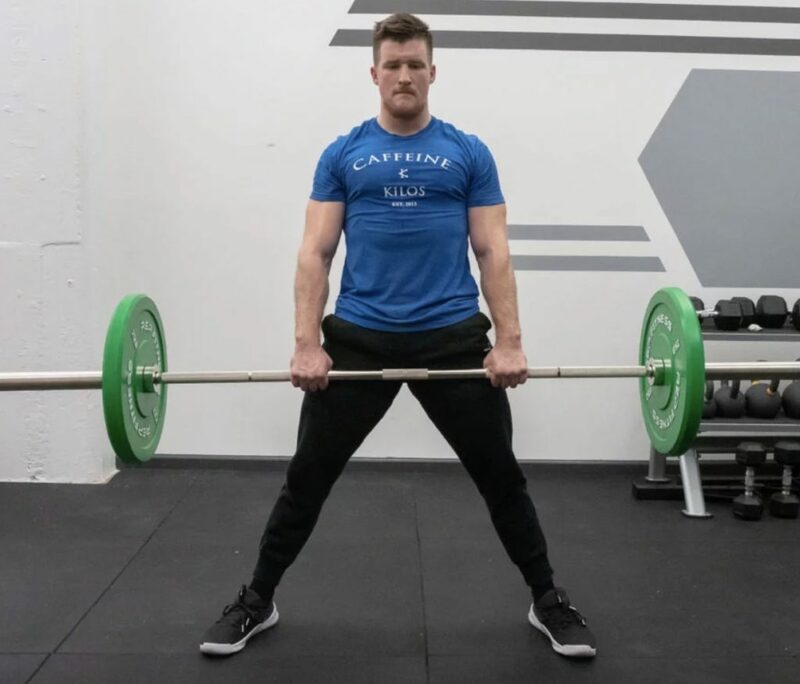 The clean deadlift is a deadlift variation done primarily in olympic weightlifting training, specifically to prepare an athlete’s positional pulling strength for the clean. In the clean deadlift, the athlete tends to have the hips start slightly lower than a conventional deadlift, however almost similar to the trap bar deadlift. In doing so, like the trap bar deadlift, the clean deadlift can increase glute, hamstring, and quadriceps strength specific to the sport movement. It is for this reason that the trap bar deadlift and the clean deadlift can be seen as very similar pulling movements for Olympic weightlifters. NEED a Stronger Sumo Deadlfift? Notice how we said, “NEED” vs want?! Check out these sumo deadlift training articles to boost strength and performance! Sumo Deadlift Plateau? Try Pulling from a Deficit!